Cette publication est une traduction de St-Onge, M R; Rayner, N M; Steenkamp, H M; Gilbert, C; (2015). Geology, Terra Nivea, Baffin Island, Nunavut, Commission géologique du Canada, Carte géoscientifique du Canada no. 215E, éd. prelim. 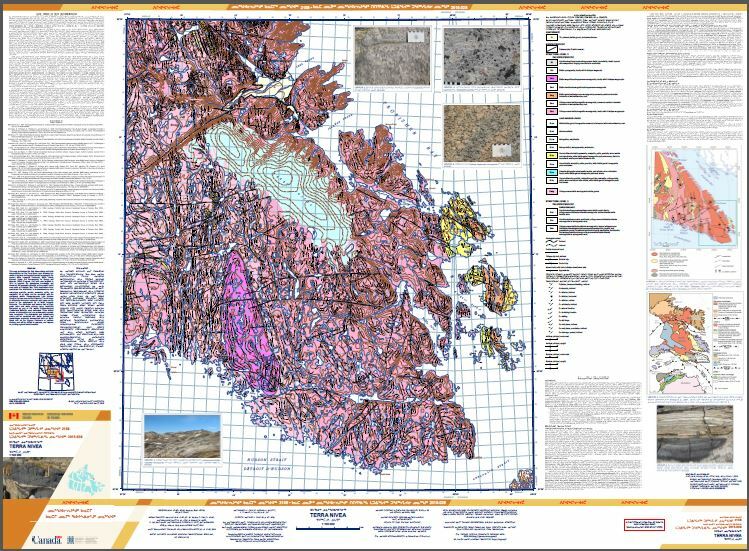 This map synthesizes the field observations and initial interpretations for the Terra Nivea area following five weeks of regional and targeted bedrock mapping on the eastern Meta Incognita Peninsula, Baffin Island, Nunavut. Under the Geo-mapping for Energy and Minerals (GEM) Program, this area was targeted in 2014 to upgrade the geoscience knowledge and document the economic potential of the greater Iqaluit area south of Frobisher Bay. Field observations have constrained the distribution of metasedimentary units comprising quartzite, marble, psammite, pelite, and semipelite, all of which can be correlated with the contiguous middle Paleoproterozoic Lake Harbour Group in the type area north of Kimmirut. The full range of siliciclastic and minor carbonate rock types can be traced to the easternmost tip of Meta Incognita Peninsula. The distribution and eastern limit of high-grade felsic and mafic plutonic rocks, tentatively interpreted as part of the middle Paleoproterozoic Cumberland Batholith, were delineated. Three distinct phases of deformation and one metamorphic episode were recognized. The deformation and metamorphic events can be correlated with similar features and assemblages previously documented both on Baffin Island and on the Ungava Peninsula of northern Quebec, and will be utilized to compare, and improve on, existing regional tectonic models.